Checklists, like the Index Card Cure™, can be used to help manage the complexities of modern life. As Atul Gawande, MD wrote in “The Checklist Manifesto,” there are situations where a simple to-do list may help save lives. In medicine, Dr.Gawande writes, the problem is “making sure we apply the knowledge we have consistently and correctly.” An example cited discusses how a short checklist nearly eliminated central line infections for intensive care patients at Johns Hopkins Hospital. In many cases, we know what works, but may apply that knowledge inconsistently. Perhaps we get distracted or overwhelmed. When I worked as a chaplain responding to traumas, the ER would sometimes get swamped with multiple patients from a car crash. In the chaos, a checklist would keep various staff apprised of the correct next step. Any profession with complex tasks, like aviation, subscribes to checklists. With lives at stake, we don’t want to fly with a pilot who skips an essential step. Our lives have gotten equally complicated. No matter how expert you are at your job, a list ensures consistency. Codify your routine so you don’t reinvent the wheel every day. 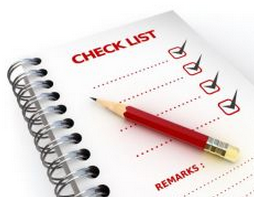 Why not develop a checklist to enhance your personal productivity?